It wasn’t scripted, but it paid off anyway. Harris joked he deserved an assist on the play but wasn’t credited with one. ”It was definitely a pass and I’m sticking with it,” he said. Durant, who didn’t attempt a shot in the first quarter, was 12 of 16 from the field the rest of the game. He had nine points in the fourth when Golden State appeared to take control, but Denver rallied to take a 102-99 lead on Barton’s 3-pointer. Warriors: F David West (personal reasons) and Jordan Bell (left ankle) were out of the lineup. … G Shaun Livingston returned after missing Friday’s game for personal reasons. … C JaVale McGee had five fouls in 6:15 but also finished with a game-high four blocks. Nuggets: Trey Lyles had 15 points and 10 rebounds. 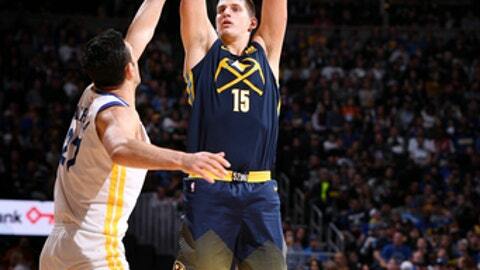 … F Mason Plumlee missed his third straight game with a right calf strain. … F Wilson Chandler did not take part in the morning shootaround due to illness but was in the starting lineup and had five points in 23 minutes. … The announced crowd of 20,103 is the largest for a Nuggets game in Pepsi Center history.